In order to ensure the future supply of electricity we require sustainable concepts that preserve resources and do not harm our environment. Humankind needs a reliable and secure power supply that is also environmentally friendly and economic – today and in the future. On the one hand, the grids that are needed to transmit and distribute electricity comprise cables and transmission lines, and on the other, components such as transformers and switchgear. Designs (topology) of transmission and distribution grids vary depending on the application. For example, in the case of distribution grids we can make a distinction between utility grids and those of industrial customers. But it is also the available switchgear technologies that open up various possibilities for grid design. Thus, manufacturers and above all grid operators must find well-balanced solutions under a wide range of criteria. Synthetically produced sulphur hexafluoride (SF6 gas) makes an important contribution to this task. As an insulation and arc-extinguishing medium in high and medium-voltage switchgear, SF6 has enabled a continuous development of advanced solutions in the transmission and distribution of electrical energy like no other technology since 1960. Immediately after the Kyoto Protocol was signed, German manufacturers and operators of SF6 switchgear and equipment and the SF6 producer Solvay Fluor und Derivate GmbH & Co. KG declared their commitment to avoid and reduce emissions throughout the entire product life cycle and also to monitor SF6 emissions. The German government expressly acknowledged this voluntary commitment in 1997. Switchgear manufacturers, electricity suppliers and Solvay Fluor prepared an initial life cycle assessment study as early as 1999. The study involved the analysis of an urban electricity transmission system. This previous life cycle assessment showed that the use of SF6-insulated high-voltage switchgear in urban energy supply is advantageous even from an ecological aspect. Subsequently, a more detailed study became necessary for the area of medium-voltage switchgear in energy distribution. 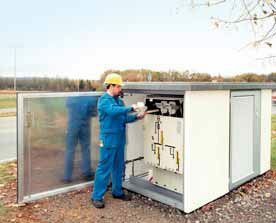 Within the scope of its considerations to implement the National Climate Protection Programme, the German Ministry for the Environment considered the relevance of SF6 in medium-voltage switchgear in regard to this programme. Therefore, to obtain reliable information about the environmental profile of medium-voltage switchgear industry performed a corresponding life cycle assessment study for the power distribution at the medium-voltage level in 2003. On the one hand, life cycle assessment studies such as the one presented here should create a platform for a sound environmental discussion, and on the other hand, demonstrate possibilities for further ecological optimisation to the companies involved. The goal and scope of the present study is to develop an environmental profile of power distribution in the medium-voltage range with a comparison between air-insulated switchgear (AIS) and gas-insulated switchgear (GIS). The study was commissioned as a joint project by ABB, AREVA T&D (formerly: ALSTOM), SIEMENS, EnBW, E.ON Hanse, RWE and Solvay Fluor. The life cycle assessment was conducted in accordance with ISO 14040–43 standards and included the participation of scientists and other stakeholders in the advisory board as well as a critical review by an external, independent verifier from TÜV NORD CERT. In the course of the study, data was gathered for a representative mix of medium-voltage switchgear: transformer substations, ring-main units (RMU) and customer substations. The data included electrical key figures (in particular ohmic losses), material data from disassembly analyses as well as electrical load and lifetime. To determine the quantity structures two different approaches were taken. For the system approach on grid level two representative model grids were examined: on the one hand, an urban and on the other, a rural region. These model grids are characteristic for utility grids and have a large number of ring-main units (RMUs). On the basis of the network calculation it was also possible to include ohmic losses of cables, transmission lines and transformers. On the switchgear level a representative German mix of medium-voltage switchgear was determined based upon a current delivery statistic from the Zentralverband Elektrotechnik- und Elektronikindustrie (ZVEI). This mix covers the complete range of switchgear types both for use in the utility grids and for industry and infrastructure grids. However, an investigation at the switchgear level means that the considerable ohmic losses of cables, transmission lines and transformers are not taken into consideration. 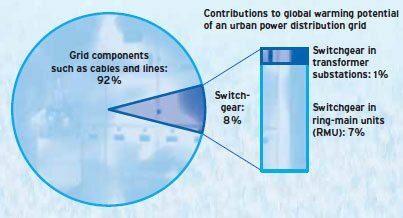 When the total global warming potential (GWP) of a representative urban distribution grid is considered the switchgear only makes a minor contribution. Rather, other grid components such as cables and transformers play the decisive role – regardless of whether AIS or GIS technology is used. The system approach on grid level is indispensable to obtain meaningful results. On the one hand, it confirms that the total contribution of power distribution grids to the global warming potential in Germany is very low. On the other hand, ohmic losses are clearly identified as the main determinant of this contribution to global warming potential. Consequently, the differences between the switchgear technologies are marginal compared to the significant ohmic losses from cables, transmission lines and transformers. For this reason alone, regulations aimed at switchgear will not accomplish any relevant climatic protection potential. The figure shows an overview of the environmental impact categories that were examined in the study at switchgear level. It is based on a representative mix of all switchgear types in the medium-voltage range on the basis of a ZVEI delivery statistic. 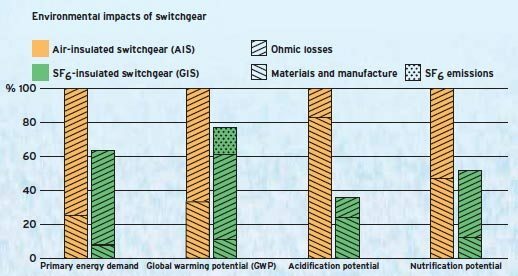 Clear advantages for SF6-insulated (GIS) compared to air-insulated switchgear (AIS) are also shown in regard to global warming potential (GWP). However, if a detailed investigation is made at switchgear level a comparison of air-insulated (AIS) and SF6-insulated (GIS) technologies shows the advantages of the SF6-GIS technology in regard to primary energy demand, acidification potential (acid rain), eutrophication potential (over-fertilisation) and global warming potential (GWP). It has been shown that the determining factors impacting on the global warming potential are in fact the electrical loads in the grid and the switchgear. The current trend towards higher capacity utilisation of the grids increases the advantages of SF6-insulated switchgear. Thus, to accomplish any significant climatic protection potential it would appear that load management in grids would be more promising than a further optimisation of switchgear design. In principle the results of this life cycle assessment can be transferred to other European countries. A sensitivity analysis shows that the selection of primary energy carriers used for electricity generation, as the most significant regional factor, only has a minor effect on the results. The life cycle assessment study presented here demonstrates the advantages of SF6-insulated (GIS) compared to air-insulated switchgear (AIS) at a switchgear level. The switchgear themselves, however, only make a very minor contribution to global warming potential. The design and capacity utilisation of the power distribution grids have a much greater influence, regardless of whether AIS or GIS technology is used. Therefore, bans and application restrictions on the use of SF6-insulated medium-voltage switchgear cannot be justified from an ecological point of view. Consequently, regulations aimed at switchgear and components will not make any significant contribution towards climate protection. Rather, grid operators for whom also other criteria such as economic efficiency and personal safety are relevant should be given freedom of choice when selecting switchgear technology.